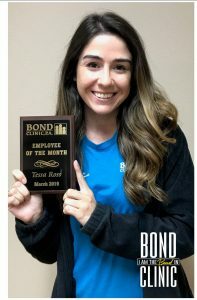 March 2019 Employee of the Month - Bond Clinic, P.A. Bond Clinic, P.A. Tessa Ross was awarded 2019 March Employee of the Month. Congratulations to Tessa Ross for being selected as the March 2019 Employee of the Month! Tessa was nominated because she exemplifies the role of a front office staff member. The patients respect her prompt and caring service and she handles all of her responsibilities with excellence. Tessa is a Receptionist in the Urology Department and she began her employment at Bond Clinic in August of 2016.